Everyone's felt out of place at some point - be they female, minority, a geek, a non-conformist, or just boldly individual. 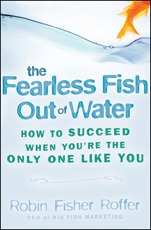 Fearless Fish will show readers how to stay connected while maintaining a unique identity, how to fit in without blending in, how to transform exclusion and have an impact. After all, there is tremendous opportunity for influence when you're on the edge -- you're already noticed! Fearless Fish will demonstrate how to make the most out of being noticed as you gain the tools for becoming more of who you are, instead of trying to change who you are. It will help readers use the tools they already have to find everything they want in their careers -- without sacrificing their souls.